Design Psychology expert Jeanette Fisher shares research-based secrets to selling houses for more than the competition. Design Psychology, a science and art that reinvents interior design, attracts buyers who won't hesitate to pay top dollar for a home's emotional and lifestyle benefits. Jeanette Fisher's latest book reveals new interior design strategies for redesign and home staging methods to prepare houses for sale. Sell Your Home for Top Dollar--FAST! Design Psychology for Redesign and Home Staging helps home sellers prepare their homes for a quick, profitable sale by choosing design elements that appeal to buyers on an emotional level. Fisher shares the concepts that helped her sell a home in Lake Elsinore three hours after it was offered for sale, for more than the asking price. Fisher has sold over thirty personal and investment homes and has built a multi-million dollar real estate portfolio using her unique methods. Fisher describes how to redesign or fix up homes to attract a specific type of buyer with purposefully chosen design elements. Fisher offers a strategic design and marketing plan to make buyers connect to a home from first glance. She says, "It's easy to sell a house when a buyer can see, hear, smell, feel, and even taste that they want to buy your home." The step-by-step book offers creative ways to prepare your home for sale along with ways to "redesign" with color psychology, lighting, and landscaping. Design Psychology tips for home staging suggest ways a buyer will enjoy an improved lifestyle if they buy your home. Fisher also uses psychology to market a home to highlight its emotional benefits and make it stand out from all other houses on the market. She describes how to make a home sales flyer like one that generated three offers the same day for a two bedroom home in San Jacinto, California. Fisher discovered her unique brand of Design Psychology methods when her family renovated a Queen Anne Victorian home in Palatka, Florida. She has researched how people respond to interior design details for over 15 years, enhancing her own successful real estate investment career with research from the University of Florida, Harvard University, and the University of California. 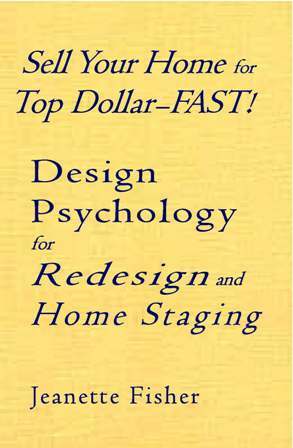 Jeanette Fisher also wrote Home Staging for Top-Dollar Sales, Doghouse to Dollhouse for Dollars: Using Design Psychology to Increase Real Estate Profits, Joy to the Home: Residential Design Psychology for Happiness and Well-Being, and other books. Besides flipping houses, Jeanette teaches Design Psychology and real estate investing. Copyright 2005 Ted Blake. All rights reserved. Sell Your Home for Top Dollar-FAST!